Conservatives now argue that the political consequences of stopping funding have been overstated. Survivors of the last major closure beg to differ. Go ahead, shut it down! That's the new cheer from the conservatives pushing to defund Obamacare. To their lily-livered compatriots who worry that the Senate will reject the defunding gambit, resulting in a shutdown when the federal government runs out of money at the end of this month, they claim that wouldn't actually be so bad: Americans, they say, would cheer the Republicans for sticking to their principles and opposing the unpopular health-care legislation. It's a case increasingly being made by activists on the right, who cite polling data and a revisionist view of the 1995 government shutdown. But under close scrutiny, the claims don't hold up. The contention that Americans would cheer a shutdown rests on a new Rasmussen Reports poll that supposedly shows a majority of Americans favor shutting down the government to defund Obamacare. It was emailed to me by a conservative activist, Scott Hogenson, who wrote, "RE: Obamacare and the prospect of a government shutdown. Seems a majority of Americans would be okay with that." LaTourette remembers the shutdown as a chaotic time for the House Republicans, due partly to the improvisational leadership style of then-Speaker Newt Gingrich. “There was no map for it. Nobody knew what the rules were,” he told me. “It was a little like the dog catching the car.” In meetings that went till 2 or 3 a.m., members agonized over how to resolve the standoff. While the shutdown was under way, it wasn’t immediately clear who the public would hold responsible. Subsequent accounts, LaTourette noted, reported that the White House was just as worried as the Republicans in Congress about suffering political consequences. But in the end, he said, independent voters concluded from the crisis that the GOP couldn’t be trusted to govern. “We took the worse end of the public backlash -- [it was] ‘Why can’t you guys play nice?’” LaTourette said. Gingrich was famously depicted as a tantrum-throwing toddler on the cover of the New York Daily News, under the headline, "CRY BABY." Other contemporaneous observers agree with LaTourette’s account. 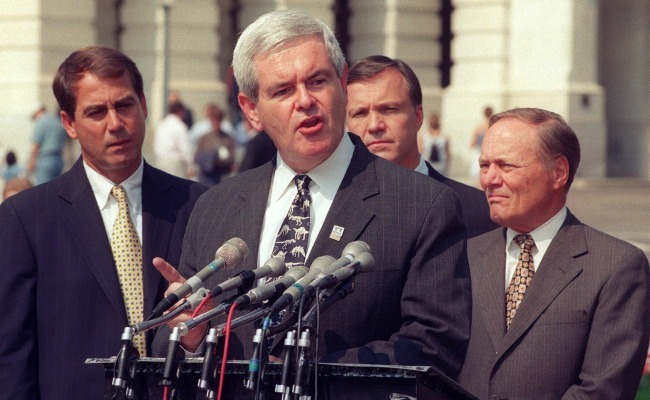 Conservative columnist Charles Krauthammer wrote last month that the 1995 shutdown “effectively marked the end of the Gingrich revolution,” an important point: The loss of confidence Republicans suffered from the shutdown doomed the rest of their policy agenda. “Nothing could better revive the fortunes of a failing, flailing, fading Democratic administration than a government shutdown where the president is portrayed as standing up to the GOP on honoring our debts and paying our soldiers in the field,” Krauthammer added. During the speech, Clinton singled out for praise a man seated next to First Lady Hillary Rodham Clinton — Social Security Administration worker Richard Dean, who had survived the Oklahoma City bombing and rescued three people from the devastated Murrah Federal Building. As Republicans stood and applauded Dean’s heroism, Clinton pulled out the knife, recounting how Dean was forced out of his office during the first shutdown and had to work without pay in the second one. “Never, ever, shut the federal government down again,” the president scolded. Conservatives rooting for a shutdown may believe things would be different this time around. But history suggests that if a shutdown comes to pass, Republican leaders would spend a lot more sleepless nights yelling at their televisions.